Certain Play-Fi products have the capability to capture audio from one of their on-board audio inputs and then redistribute it through a Play-Fi group. We call this Line-In Streaming, and speakers paired together streaming from Line-In are called a Line-In Zone. 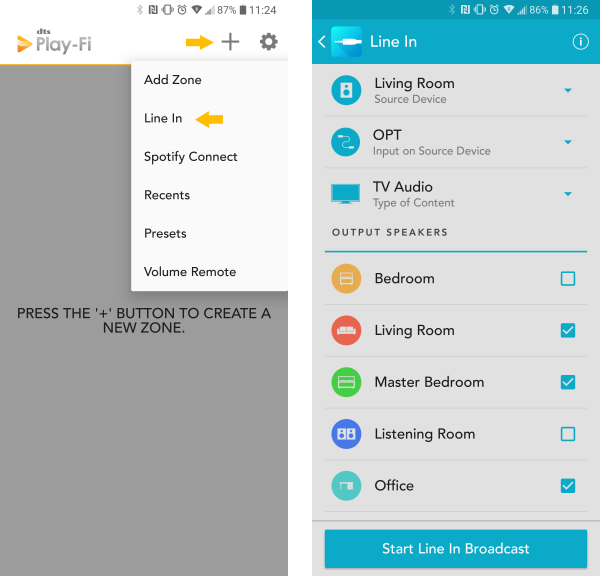 To initiate a Line-In Zone, simply tap on the Add Zone button—which is the little + icon at the top of the main Play-Fi Control screen—then select the Line-In option. 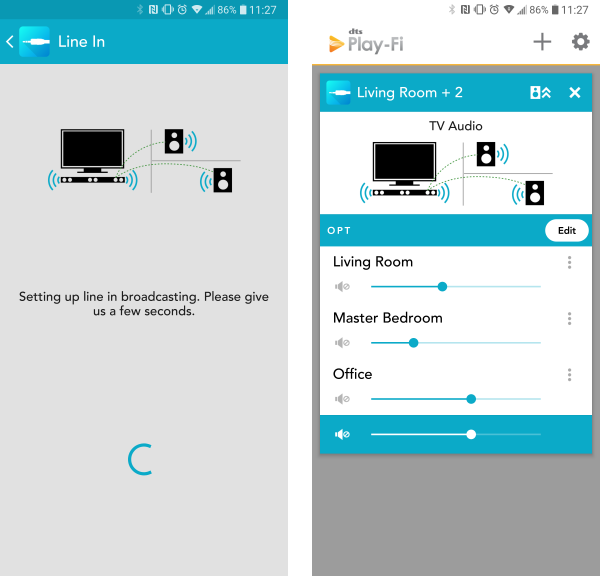 If your network has a Play-Fi product that supports Line-In Streaming, the Line-In screen will display and list the products you can pick to lead the zone. After selecting the product, if it has more than one audio input, you'll be able to select which one you'd like as the source. You can also select between the content type, which includes a Music mode that uses DTS Play-Fi's lossless streaming method with a buffer to maintain audio playback integrity, and a TV Audio mode which removes the buffer and makes use of premium DTS codecs to transport across the network at high speeds to maintain synchrnicity with the source content. Lastly, you'll be able to select the additional Play-Fi products to join to the Line-In Zone. The best part is that the app automatically remembers your last configuration, so that you can start streaming quickly the next time. Once you're ready to go, just tap the Start button, and the app will send all the information over to the host product so that it can configure the zone. Now that everything is up and running, you can close the app or leave the network, and the Line-In Zone will continue to run so long as there is content being played on its input.